Timbuk2 is a company that likes to change its product line often, frequently offering bags that are only available for one season. They also like their novelties too, which they sometimes give out as promotional items. Take this beer cozy that fits on on your bag strap. 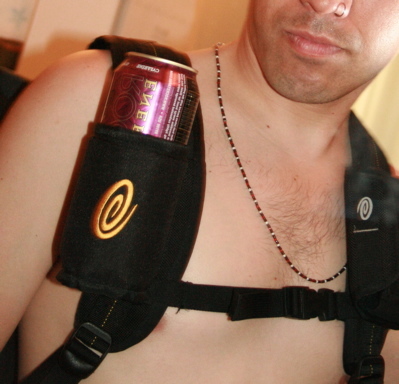 It actually holds a can quite securely; there is no chance that your beverage will fall out while riding. In fact, it would be difficult to remove a can without using both hands. That and the inherent spill factor of having an open beverage strapped to your chest means that the cozy isn’t useful once you crack it open. So here’s my design advice: change the cozy so the can is perpendicular to the strap rather than parallel and then make it accommodate 4-5 cans. Now you have a beer BANDOLEER! Genius! My god, why hasn’t some company snapped me up as a product designer? I’d be such a can’t-miss bargain; I practically work for ramen. Previous Previous post: Tyler’s going to the Toor day Frants! Next Next post: Save South Seatac – Tonight!